On Easter evening, I was craving for pork. So, we headed to Ingolf German restaurant but unfortunately, the place was fully reserved. I guess all the Catholics were craving pork at the same time? Hubby who went to park his car earlier had paid for one hour parking fee and the man refused to go elsewhere ‘cos he said the money will be wasted. So, I had to stand there, pondering hard whether I should eat at the Bulgarian restaurant next door. I had a rather unpleasant experience in my last visit to this Bulgarian restaurant. 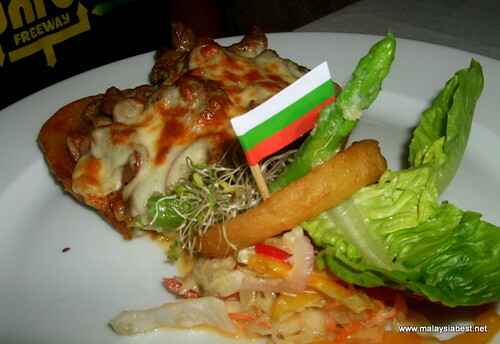 We can’t think of any other places serving pork except Edelweiss so we decided to eat Bulgarian. They were having some set dinner at only RM50++ per person which include a glass of red wine, soup or appetizer, main meal and dessert. We ordered two sets because we know their portions are huge. My hubby ordered a plate of spaghetti with cream sauce from the ala carte menu. 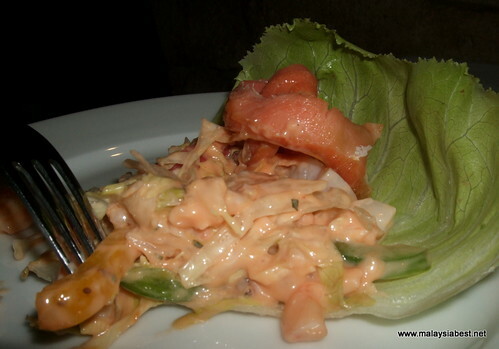 My son ordered the salad which is loaded with shrimps and smoked salmon. Meanwhile, I had the mushroom soup which is tasty. They also provide generous portion of butter and hot dinner rolls. My son’s steak with cheese and potatoes is overflowing with melted cheese. The meal come with a portion of pickled cabbage, asparagus, fries and other type of greens. I love the pork knuckle which is huge. 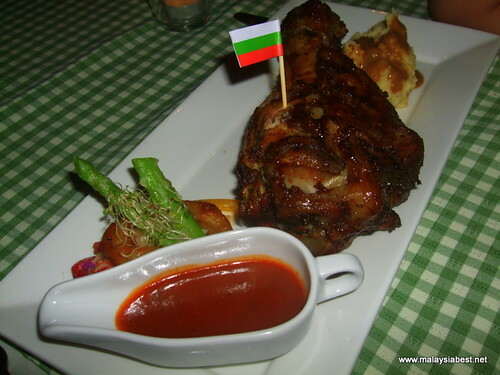 The pork knuckle is roasted till tender, with some melt in the mouth fats. They give some barbeque sauce but I didn’t pour the sauce because the knuckle is tasty as it is. With the two main meals and the spaghetti, four of us were already struggling to finish them. Lucky we didn’t order three meals or we would need to pack them again. The dessert was banana cheese cake and it was yummy. I think this restaurant has changed all their waiters and waitresses. The new batch seems better compared to the previous visit where they tried too hard to be hospitable. 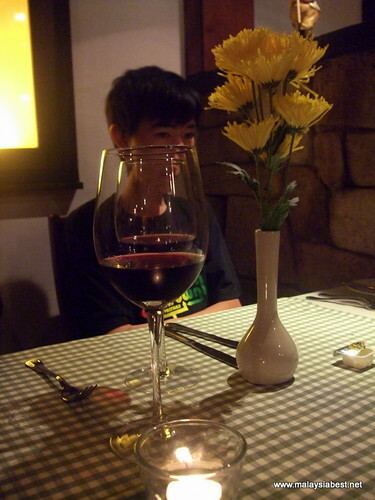 The only bleh of the evening was this moron who was trying to show off his cheap glass of red wine. He sat there, trying to impress the girlfriend by swirling the glass almost the whole time! Doh! Just because he watched some crappy Astro AEC cookshow, he must think he is some fine dining connoisseur. I feel like going over to his table and pour my glass of red wine on his head and tell him to stop swirling because the action is giving me headache. LOL. If they have changed a new batch and improved the food quality after so many months, then I shall pay a visit again. I didn’t have much good experience too last time. The pork knuckles looks good. can i know where is this place? Hello there, nice blog. I know what you mean about the sort of people who show off. However, red wine does get better as it “breathes” over time, so as you continue drinking a good bottle of red wine, you can continue swirling it in the glass and also smelling and tasting it continually. It is only bad manners to taste it as one would at a winery or vineyard, ie slurp it into the back of the throat before swallowing it. Worst of all is, of course, spitting it out LOL. Cheers!